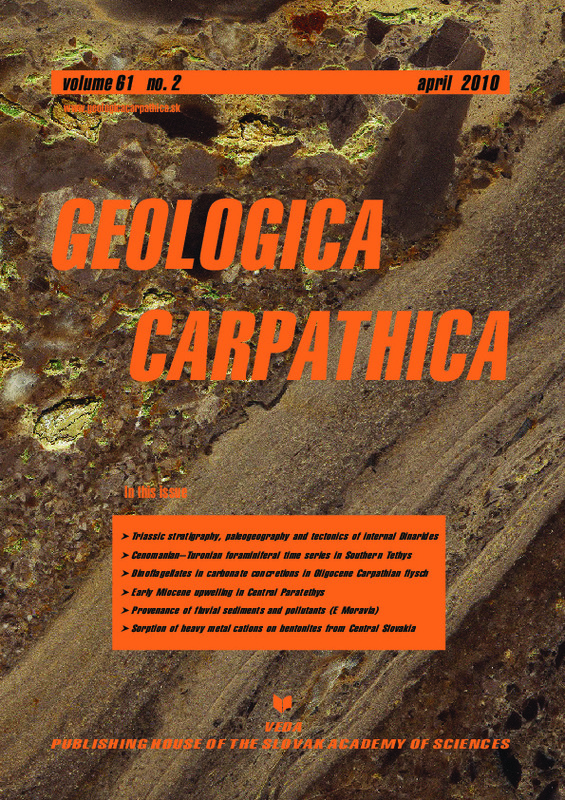 Abstract: Strongly deformed and metamorphosed sediments in the Studenica Valley and Kopaonik area in southern Serbia expose the easternmost occurrences of Triassic sediments in the Dinarides. In these areas, Upper Paleozoic terrigenous sediments are overlain by Lower Triassic siliciclastics and limestones and by Anisian shallow-water carbonates. A pronounced facies change to hemipelagic and distal turbiditic, cherty metalimestones (Kopaonik Formation) testifies a Late Anisian drowning of the former shallow-water carbonate shelf. Sedimentation of the Kopaonik Formation was contemporaneous with shallow-water carbonate production on nearby carbonate platforms that were the source areas of diluted turbidity currents reaching the depositional area of this formation. The Kopaonik Formation was dated by conodont faunas as Late Anisian to Norian and possibly extends into the Early Jurassic. It is therefore considered an equivalent of the grey Hallstatt facies of the Eastern Alps, the Western Carpathians, and the Albanides–Hellenides. The coeval carbonate platforms were generally situated in more proximal areas of the Adriatic margin, whereas the distal margin was dominated by hemipelagic/pelagic and distal turbiditic sedimentation, facing the evolving Neotethys Ocean to the east. A similar arrangement of Triassic facies belts can be recognized all along the evolving Meliata-Maliac-Vardar branch of Neotethys, which is in line with a ‘one-ocean-hypothesis’ for the Dinarides: all the ophiolites presently located southwest of the Drina-Ivanjica and Kopaonik thrust sheets are derived from an area to the east, and the Drina-Ivanjica and Kopaonik units emerge in tectonic windows from below this ophiolite nappe. On the base of the Triassic facies distribution we see neither argument for an independent Dinaridic Ocean nor evidence for isolated terranes or blocks. Abstract: Time series analysis has been performed for the first time on the Cenomanian-Turonian sequence in Central Tunisia in order to shed light on its Milankovitch-like cyclicity. This analysis was applied to two foraminiferal genera: the biserial Heterohelix, an oxygen-minimum zone (OMZ) dweller, and the triserial Guembelitria, a eutrophic surface dweller. Average sedimentary rates and the duration of the oceanic anoxic event (OAE2) in each studied section were estimated. The fluctuations in abundance of these two opportunistic species can be related mainly to both precessional (ca. 20 kyr) and eccentricity (100 and 400 kyr) cyclicity suggesting that changes in surface water fertility were linked to climate changes in the Milankovitch frequency band. Abstract: Carbonate concretions found within the Krosno shales (Polish Outer Carpathians) have formerly been interpreted as limestone exotics. Both the concretions and the host shales yield well preserved organic-walled dinoflagellate cysts. The dinoflagellate cyst assemblages provide valuable age-diagnostic information: they indicate a mid-Oligocene age and prove the concretionary origin of the carbonates. Detailed analysis of relative abundance, biodiversity and paleoecology of the dinoflagellates from concretions provides additional information on the sedimentary environment and the model of concretion formation. Abstract: Evidence for regional upwelling conditions in the Central Paratethys Sea is presented for mid-Burdigalian (early Ottnangian) times. The oceanographic phenomenon is detected in clay-diatomite successions along the steep escarpment of the Bohemian Massif in the eastern North Alpine Foreland Basin. Interpretations are based on a multi-proxy data-set including published sedimentological and paleontological data, newly performed stable isotope measurements (δ18O, δ13C) of foraminifers and bulk sediment samples, and analyses of dinoflagellate cyst assemblages. The revealed stable isotope values of planktonic foraminifers point to upwelling: low δ13C values indicate strong mixing of surface waters with rising nutrient-rich waters, high δ18O values reflect cool sea surface temperatures (SST). Temperature calculations give SSTs ranging from 10–14 °C. Cool SSTs and high productivity are additionally supported by bulk sediment analyses. Assemblages of dinoflagellate cysts indicate a distal-shelf environment with nutrient-rich waters. Westerly winds and tidal currents are discussed as potential driving forces behind the local upwelling event. As mid-Burdigalian geography favoured strong current patterns in the Central Paratethys as documented in the sedimentary record from the Rhone Basin to Hungary upwelling might have been a more common phenomenon in this epicontinental sea than currently known. Abstract: Modern fluvial deposits of a small fluvial system were studied in the area of eastern Moravia (Czech Republic) with the aim of determining the provenance of the deposits and weathering processes. Identification of the source rocks and their alongstream variations were used for the evaluation of the natural or anthropogenic source of the heavy metals. Paleogene flysch sandstones, flysch mudstones and Quaternary loesses represent source rocks and reflect both the role of recycling and local sources. Provenance from sandstones dominate upstream whereas mudstones represent dominant source rock in the downstream part of the fluvial system. The contents of Pb and Zn are highly enhanced when compared with the natural background in the entire study area. Their anthropogenic source is connected with the rubber/shoe manufacturing industry and traffic. The contents of Cr, Co, Cu, Ni and V are usually lower in modern deposits than in the identified source rocks. Abstract: The main purpose of this work was to determine adsorption characteristics of heavy metal cations on two Slovak bentonites. Adsorption of Pb2+, Zn2+, Cu2+ and Cd2+ on Jelsovy Potok (JP) and Lieskovec (L) bentonites was studied by the batch equilibration technique using solutions of different concentrations. Higher smectite content (81 mass %) and higher cation exchange capacity (CEC) (105 mmol M+/100 g) of JP bentonite cause higher adsorption of all heavy metals in comparison with L bentonite. JP adsorbed heavy metals in the order Pb2+>>Cd2+>Zn2+>Cu2+ while sorption on L was slightly different, Pb2+>>Cd2+>Cu2+ ≥ Zn2+. The Freundlich model of adsorption is more appropriate for adsorption of Pb2+ and Cd2+ while lower uptake of Cu2+ and Zn2+ is better described by the Langmuir model. Negative ΔG° values indicate that the adsorption process of all cations on both bentonites is feasible, spontaneous and exothermic. The decrease in the d001 spacings from 14.8–14.9 Å in natural dominantly Ca2+-saturated samples to 13.2–12.6 Å for both bentonites saturated with four heavy metal cations shows the effect of less hydrated exchangeable cations on interlayer spacing. Jelsovy Potok bentonite of higher montmorillonite content and greater CEC is the more effective candidate for removal of Pb2+, Zn2+, Cu2+ and Cd2+ from waste water than Lieskovec bentonite.